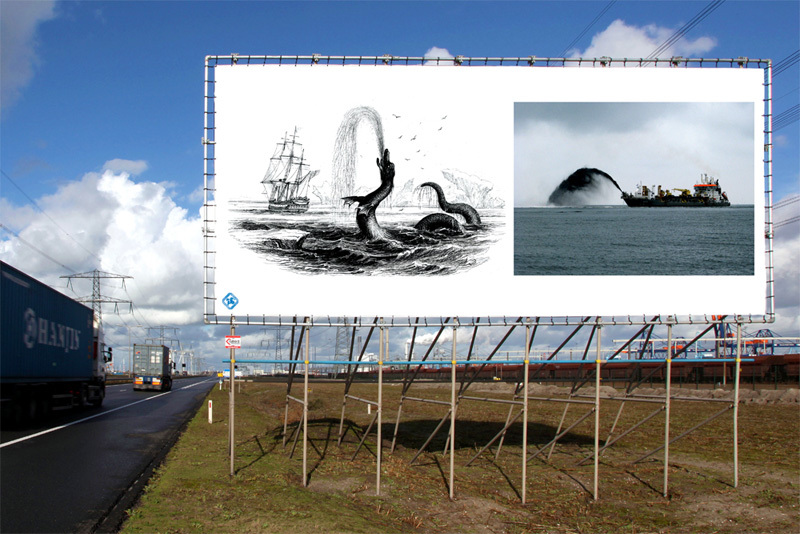 The first part of my project for Portscapes was realised as a billboard image sited on the Maasvlakte inspired by, and titled after, the blank spots on old maps which declare “Here Be Dragons”. These sea-serpent inhabited points of fearful imagination imply a gap in the understanding of the known world. I witnessed the early stages of the construction of Maasvlakte 2, when it had just emerged from beneath the sea, yet to be connected to existing land and surrounded by sand-breathing dredger-monsters. Through the motif of the dragon the billboard introduces a means of considering Europe’s connections with Asia through trade, and the differing cultural traditions of the dragon as terroriser or guardian.